- A classic design from a time of Kings and Warriors. 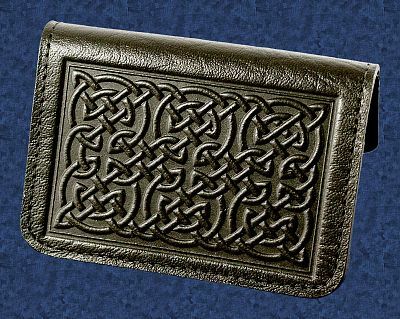 This timeless Celtic design still evokes a bit of magic from a bygone age. In black leather. Single-sided design. Our cardholders have real charm! Classy and durable, they can be used in a variety of ways. Sure, you can use them to hold your standard sized business cards. But these little beauties also make an awesome mini-wallet! Just tuck your ID and credit card on one side, and a couple of bucks in the other, and you're good to go. Measures 2 3/4" by 4" when folded. 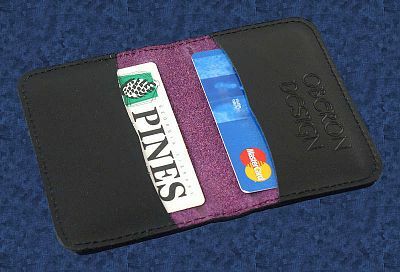 Card holders have 2 interior pockets with an unlined interior. 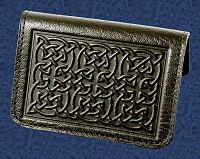 Do you have any other questions about our Bold Celtic Mini Wallet/Card Holder?